Win a $5 Amazon Gift Card!! Ends TONIGHT!! Time for a FUN and QUICK giveaway! 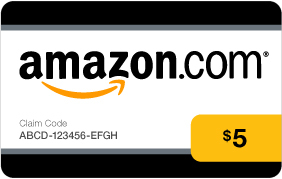 Enter below to win $5 to Amazon! Ends tonight at Midnight EST. Went out to eat. Watched a the movie The Ides of March. Watched tv w/my daughter. I spent time with my kids and my family. Best weekends are family weekends IMO. I went sledding with the kids and hubby. First time in years I actually went down the hill too. I can’t wait to go back LOL. Made a snowman with my 3 year old, his first one! I mostly sat around on my tush. LOL I just hit the 3rd trimester and my body is slowing way down on me. I had a wonderful weekend at church! it was snowy saturday, so I just stayed home for once! Nothing exciting this weekend. Caught up on some sleep! I took my daughter shopping for her winter formal and picked up my freebies at Bath and Body Works, and that was about it…pretty good weekend! here’s the link that I shared the giveaway. Rafflecopter didn’t give me a space to leave the link. My son had a basketball game, other than that we RELAXED!! I love this giveaway! I can never get enough AGC’s! I bought a potato dice on Amazon so I don’t have to do it by hand, with my hurt hands! Nothing too exciting, we had company over and that’s the only time my hubby cleans, dusts and basically we have a brand new house again it’s so clean. That’s VERY exciting to me. It gives me more time to coupon and organize. Not a darn thing, except I unfortunately had to go to the grocery store. Stayed in most of the weekend and watched METv, but did make one shopping trip to CVS. I did not do a darn thing all weekend lol! didn’t do much of anything really i am still recovery from pneumonia so i have been slowing cleaning up my house with 4 girls and being that sick and babysitting rough! lol but i love my husband he has helped me out alot the past 3 weeks. and just ow starting feel better! What did I do this weekend? I worked! But, I work in a nursing home and totally LOVE my residents, so I could have done something far worse! I cleaned and played around on the computer. Stayed home relaxed and watched some movies. I went to my fiancé’s beat battle then spent the rest of the weekend being lazy with the best little man in the world my son Elijah! No relaxed with my fiance and watched the playoffs. We put the baby crib together. I was on a trip with my daughter. Took her antique shopping for her birthday. Had a great time. This weekend we went to Monster Jam at the Bradley Center and then to applebees afterwards. We also created our pinewood derby car for the race that is this weekend. We created a tank. Hopefully he will win. Just stayed home all weekend. Love going to your website. Always surprised at the giveaways. Thank you. Love the color purple, my favorite. Stayed home and made forts with the kids and watched movies in them. This weekend I just did some of my reward programs and surveys. Spent time with the children watching a movie and eating pizza, and watching my little 8 month old try to stand o her own. I work weekends and play on a Bowling League. Thanks! Finally got a babysitter and had dinner and a movies with my husband. It was much needed. Thanks for asking and thanks for the chance to win. How was your weekend? Nothing exciting really, daughter was sick, so worried about her. I mainly relaxed and enjoyed the nice warm weather with my man this weekend. We love our quiet time. Nothing interesting, we don’t have a car, well, we have a car but is going to be retired because didn’t pass the Smog check test. replaced a hot water heater. kids had soccer on Saturday (all day thing for us lol) and we had dinner with my mom & sister on Sunday. This past weekend I was the bait for a 40th surprise birthday party. My friend’s husband was definitely surprised when he saw that a dinner with my family turned out to be a party with 50 of his friends. She got him good! not really, just spent time with family! Went to the er for a spider bite!